Hey there, hi there, ho there, guys and gals! There are super fun ways to prepare for meeting the characters before your trip, including watching movies featuring some of the most beloved characters. You could even do a countdown to your trip, by watching a different Disney film each week. Some of the most useful options? Dumbo, Pirates of the Caribbean, the Star Wars films, Frozen, Cinderella, Beauty and the Beast, Little Mermaid, The Many Adventures of Winnie the Pooh, Alice in Wonderland, the Toy Story films, Monsters Inc, Lion King, Bug's Life, Finding Nemo, and so many more! K and Max, taking a quick nap. Once you are onsite, and about to meet your first character, get yourself organized while you're in line. Have your cameras/phones and autograph books all out, and ready to go. Open your book to the next blank page. Have your pens uncapped, and ready. Sharpies work best, and Mickey's gloves make it challenging to open marker caps, so help a mouse out. Know in advance who is taking the picture and who is posing. If you absolutely MUST have one shot of just the girls, then one of just the boys, then one of The Smiths, then one of the Joneses, be organized about it, and be considerate of those that are waiting. Don't make Cinderella tell you she's going to miss the ball if you don't hurry the heck up. And absolutely take advantage of the services of the PhotoPass Photographers! The Memory Maker package is TOTALLY worth the money. The photogs have great cameras and capture really beautiful pictures that we wouldn't be able to snap ourselves, and your WHOLE family can be in every shot, including you! 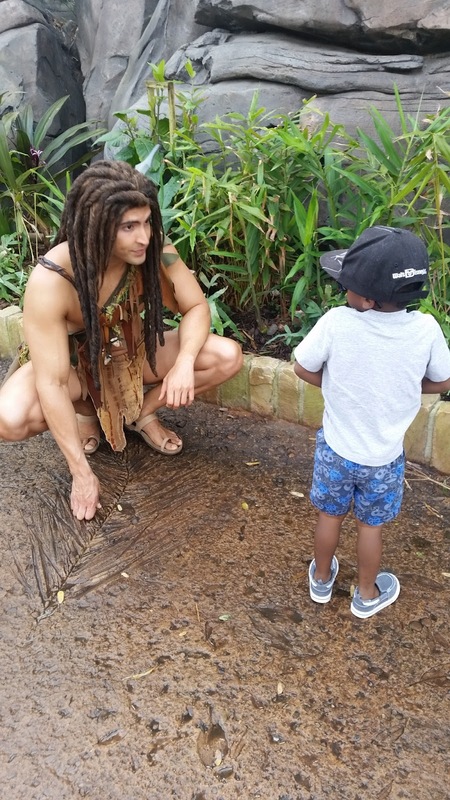 Plus, it gives you the chance to enjoy watching your kids meet the characters without having to watch the whole thing on the tiny screen of your phone, while you snap pics. You'll also help yourself a lot by knowing where and when you can meet the characters. This is very easy to do nowadays, since right on the My Disney Experience App, you can see the list of character appearances in each park and the times that they will be there. Technology. Woah. 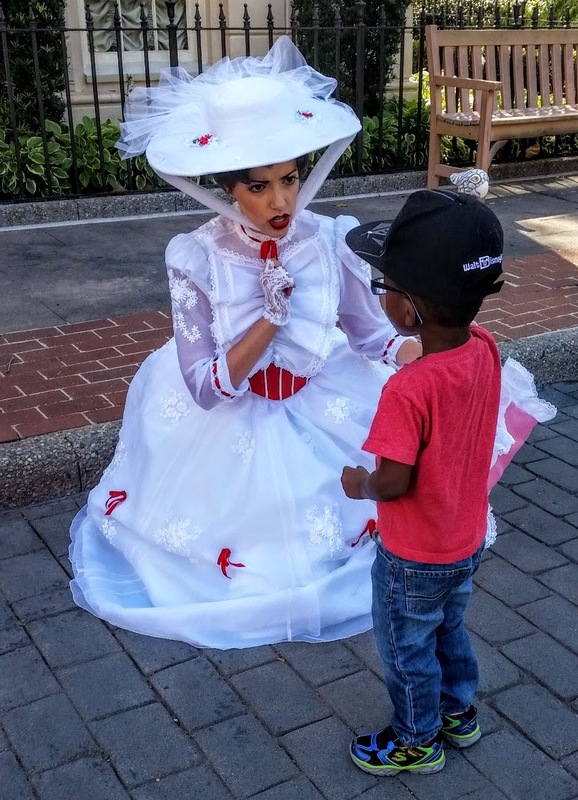 But if you don't have the app, or don't get along with technology, you can ask a Cast Member to help you out. There's a hotline that they can call and find out the meet and greet times of any character you want to see. And ALWAYS be ready for the fact that appearances are subject to change at any time. You might want to use language with your kids like, "If Donald's not busy when we get there...", and, "I hope we get to see Doc McStuffins, but it'll depend on how many patients she has!" Memory Maker with our annual passes! 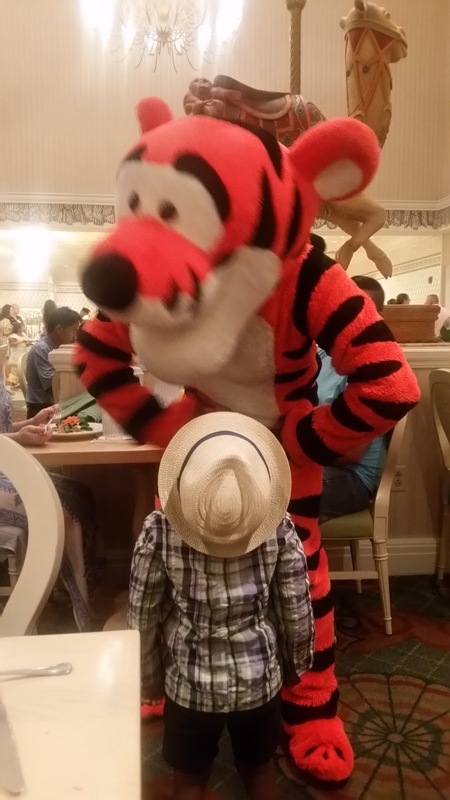 One of the BEST ways to see characters, and make sure you get enough time with each, is to book a character dining meal. There are options for breakfast, lunch and dinner, with various sets of characters including Lilo and Stitch, Princesses, Mickey and the Gang, Pooh and Friends, and more. The awesome travel planners over at Kingdom Konsultant Travel can help you book whichever meals you'd like to include in your trip. Let's face it. The characters can be scary to many kids. (And don't even get me started on the villains! I am afraid of Jafar, to this day.) They are large, brightly colored, and usually silent. This can be very intimidating. 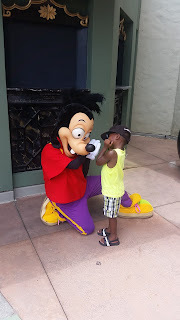 If it's the first time your little ones are meeting Goofy, you approach Goofy first. Give him a hug, and show them how docile the old dog is. If they are little enough, and they are nervous, hold your child for their first encounter. Don't force them to hug a character. Let them just high five them. 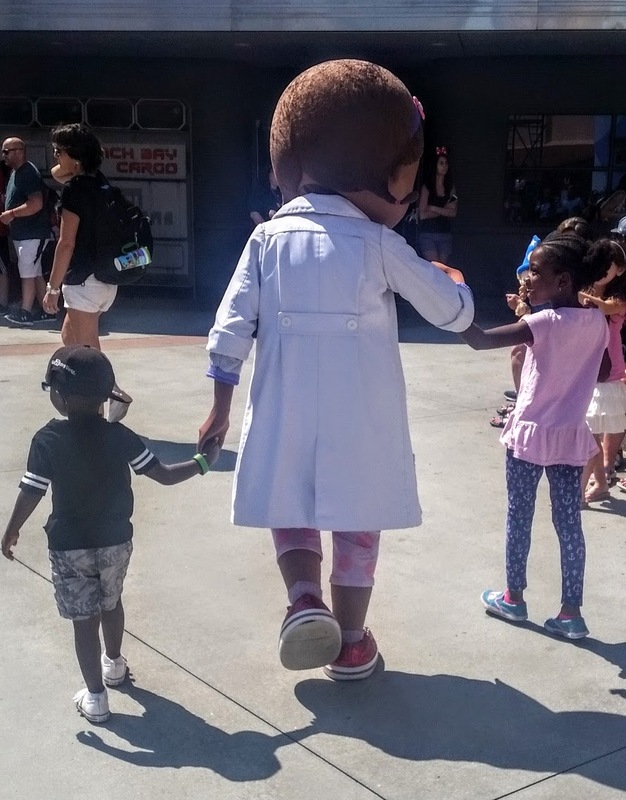 If you scare them on their first meet and greet, it'll be MUCH harder to get them to even be in a photo with any other characters. If your kiddos are very nervous, you may also want to try starting with a "face character". (Any character that is an actual human, like Cinderella, Peter Pan, Rapunzel, Ariel, Tarzan, Prince Charming, etc.) 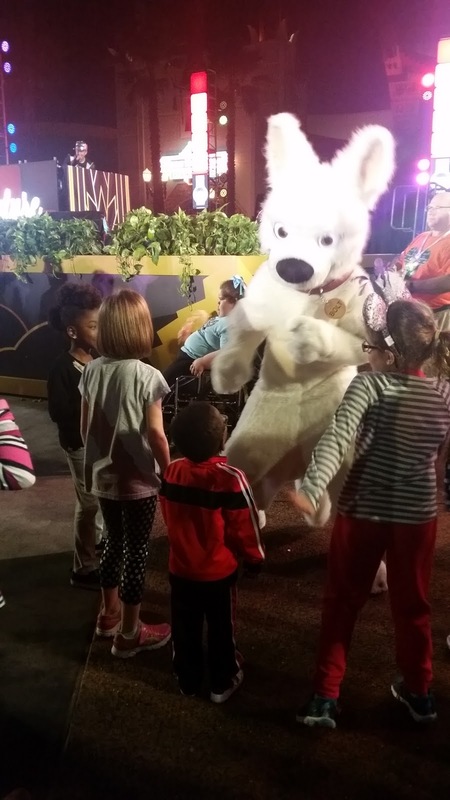 Or see the characters for the first time in a non-meet-and-greet setting, like in a parade or show. That way, your little guy can size them up before he's forced to interact with them. Ultimately, let your kid tell you what they are comfortable with, and don't push it further until they are ready. By now, I bet you know Elsa and Anna's entire backstory. You know all of the outfits that they wear, the songs that they sing, the other characters that they interact with, and maybe even their favorite foods. (FYI, the icy sisters love chocolate!) So USE what you know! This applies in two ways. Firstly, when a character is trying to communicate with your littles by signing and using their language of charades, throw them a bone. Yes, there's usually a greeter there, who can help tell your child what that character wants to communicate, but if not, be prepared to step in and help your kid understand that Minnie making a heart sign and pointing at their Mickey t-shirt is her trying to tell your kid that she loves Mickey. When Snow White asks your shy daughter for her name, make sure you are close enough to hear this, and help Snow out. It will make your experiences so much richer. D and Tiana chat about where Naveen and Louis are. Going hand in hand with that, is that you should be able to prep characters with relevant information when you can. Here's an example: You're about to meet Peter Pan, whom your daughter loves. She has just played Wendy in her school play and she adored meeting Peter on your Disney Cruise last year. While your daughter is saying her initial hellos, chime right in, "We are SO excited to see you again, Peter! We met you on the cruise last year and have been talking about you ever since. In fact, Sarah just played Wendy in her school play!" What is likely to happen is that rather than having a generic conversation with your kid, Peter now has the ability to say, "I'm so excited to see you again, Sarah! You got so tall since the cruise! Were you as good of a Wendy as MY Wendy?" And , BOOM, your child's mind is BLOWN! Now, I'm not saying ALL character experiences will be like this, but your chances of having something memorable and wonderful happen are SO much better if you do this! 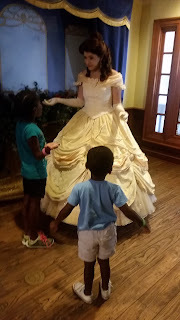 I told Tiana about how D got to choose her own middle name, and she named herself after her hero, Tiana, and well, that princess's expression completely changed. 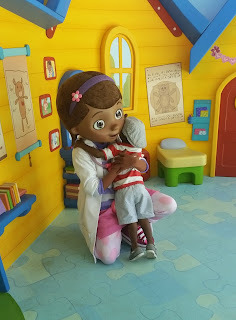 She was beside herself and understood how special this moment was to my little girl. 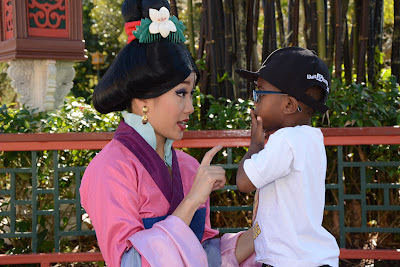 She sat with D and talked all about Naveen, and told her to make sure she stayed away from the Shadow Man. D still talks about her first meeting with Tiana all the time. D and K catch up with their friend, Belle. This is the MOST IMPORTANT tip I can offer! Please, please, remember that these aren't "people in suits". There is no need to ask, "Are you a boy, or a girl, Dale?" And please don't say, "Must be hot in there!" Repeat after me: THERE IS ONLY ONE MICKEY MOUSE. For the love of all things Walt, PLEASE don't say out loud to your kids, your friends, or anyone else anything to the contrary. We are all here because we believe in the magic, right? Or at least because we want to for a little while. So don't ruin it for your kids, or mine. Chances are, if you go to Story Time With Belle, the well-read princess may look a little different if you then go to have dinner with her at Cinderella's Royal Table. Kids remember faces, so if it's all in one day, one trip, or even if you have been to Disney recently, plan accordingly. Try not to see the same "face characters" more than one time per trip, to avoid questions from the kiddos about how Jasmine gained a few pounds overnight, or how Tinkerbell's voice changed. Have a blast and make your day a MAGICAL one!